H-Invitational Database (H-InvDB) is an integrated database of human genes and transcripts. By extensive analyses of all human transcripts, we provide curated annotations of human genes and transcripts that include gene structures, alternative splicing isoforms, non-coding functional RNAs, protein functions, functional domains, sub-cellular localizations, metabolic pathways, protein 3D structure, genetic polymorphisms (SNPs, indels and microsatellite repeats) , relation with diseases, gene expression profiling, molecular evolutionary features, protein-protein interactions (PPIs) and gene families/groups. This database is produced by the "Genome Information Integration Project" (2005-) based upon the annotation technology established in the H-Invitational Project for annotation of human full-length cDNAs. 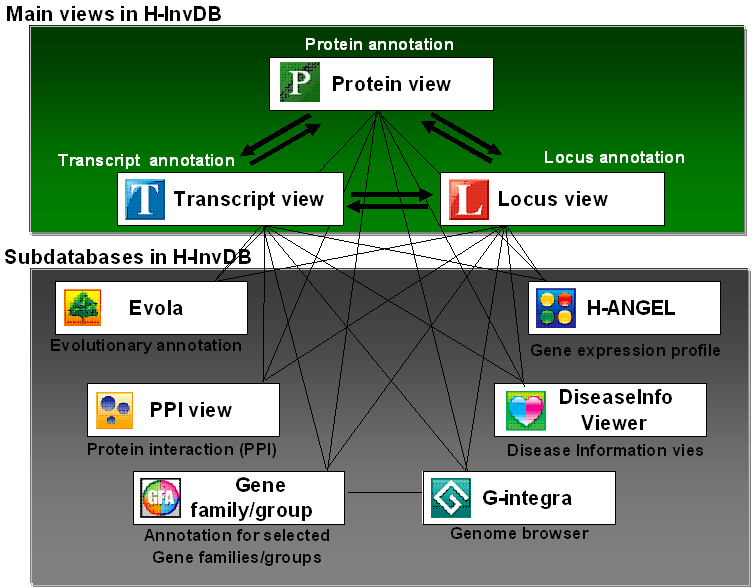 H-InvDB consists of three main views, Transcript view, Locus view and Protein view, and six sub-databases with web-based viewers; G-integra, H-ANGEL, DiseaseInfo Viewer, Evola, PPI view and Gene Family/Group view, and provided as flat files, XML files and sequence fasta files. We defined an HIT ID for each H-Inv cDNA, mRNA or RNA entry, which is a stable and unique identifier for each H-Invitational transcript. In order to identify the modification in sequence or annotation of an H-Inv transcript entry, an HIT version is assigned to each HIT ID and always stated with the HIT ID. We defined an HIX ID for each H-Inv cluster, which is a stable and unique identifier for each H-Inv cluster. A unique HIX ID is assigned to each H-Inv transcript entry identifying the location in the human genome or the unmapped cluster. In order to identify the modification in location in the human genome or annotation of the H-Inv cluster entry, an HIX version is assigned to each HIX ID and always stated with the HIX ID. We defined an HIP ID for each unique translation, which is a stable and unique identifier for each H-Invitational protein. We defined an HIF ID for each H-Inv gene family/group, which is a stable and unique identifier for each H-Inv gene family/group. A unique HIF ID is assigned to each group of H-Inv cluster entries identifying the groupings of the human gene in a context of sequence similarity and conservation of functional motif. H-InvDB provides annotation items for each HIT (H-Invitational transcript) in Transcript view, such as gene function, predicted CDS, GO, evolutionary analysis, etc. The previous name for the view was cDNA view (mRNA view). H-InvDB provides annotation items for each HIX (H-Invitational cluster) in Locus view, such as genome mapping, gene structure, alternative splicing variants, gene-expression profiles, disease related information, etc. H-InvDB provides annotation items for each HIP (H-Invitational protein) in Protein view, such as protein function, post-translational modification (PTM), InterProScan, subcellular localization, protein 3D structure (GTOP), evolutionary analysis, etc. G-integra is a genome integrated database, in which we can browse physical maps of human and related animal genome and the gene structures. DiseaseInfo Viewer is a database of known and orphan genetic diseases and their relation to H-Inv loci with LocusLink, OMIM and GenAtlas. Evola is a database of evolutionary annotation of human genes. It provides sequence alignments and phylogenetic trees of ortholog genes among human and model organisms. The PPI view displays H-InvDB human protein-protein interaction (PPI) information. H-InvDB Gene Families/Groups are human-curated annotation datasets for the selected gene families/groups. *"If you look for gene of certain feature"
*"If you have special interests in certain location in human genome"
*"If you sequenced a new gene"